I never thought in my entire life that I’d be reviewing soda. Honestly? It’s like a dream come true. I love soda, always have. I drink it like the average person drinks water. I love trying new soda, bizarre flavors, little known brands, imports. I just effing love soda. Get it? And I love reviewing things. I review video games, music, films, so getting to review soda is basically like a dream. 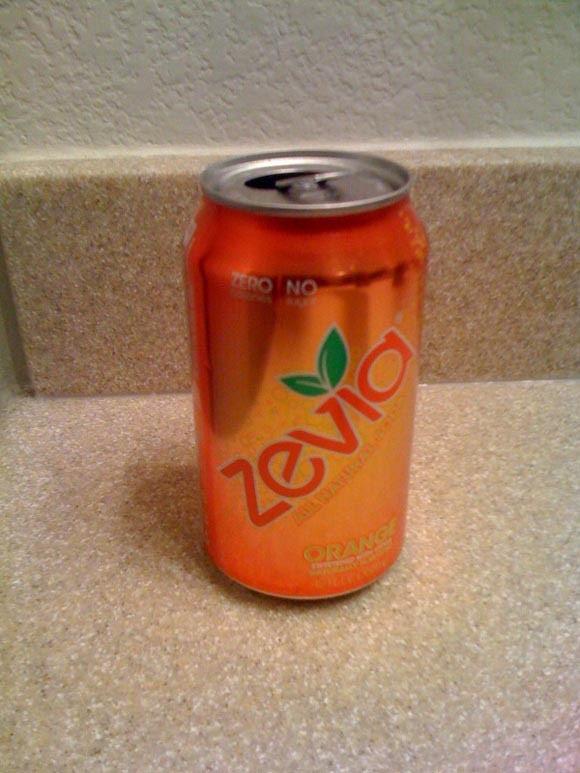 I guess the first thing I’ll say is this soda, Zevia’s sugar free all-natural orange soda, is pretty good. Underwhelming? Okay, it’s absolute carbonated pleasure wrapped in a folly of decadent flavorgasms hitting you one-by-one in rapid succession with the ferocity of a trillion lions made out of lightning. It’s pretty good. The first thing I noticed was how tame the carbonation was in contrast to how pungent the flavor was. It was interesting, I suppose I’m so used to pure cane soda that I’ve become accustomed to the hard hitting bite of Jones Soda, for example. It’s certainly not that intense to the mouth but the flavor is all there. There is a subtle tang to the drink, one can assume that’s the orange in there, but it’s also kind of masked behind the sugar substitute used. The substitute is…lemme make sure I get this right…erythritol. It’s a sugar alcohol derived from fruits themselves. It’s certainly not bad, and unlike most substitutes I’ve tasted in my time the aftertaste is actually almost more pleasant than the sip, but it is strong enough to make you wonder where the orange flavor went. All in all the drink tastes wonderful, it’s got a sweet kick to it with a unique tame sort of texture and a nice aftertaste. It’s all packaged nicely into a vibrant orange can with a sort of style that’s reminiscent of the cans Fresca comes in. It’s simplistic and stylish and even has a little symbol that lets you know it’s vegan. Vegans get their own soda? Overall I think Zevia’s orange soda hits a really great mark for sugar free sodas. It doesn’t taste like they tried to make up for the fact that they were using an alternative sweetener, it taste like they really worked with what they had and it shows. It’s sweet and pleasant. I’ll always say pure cane sugar is king but if you’re going the sugar free route this is about as good as it gets.